Frank Lloyd Wright's fascination with Japan began with woodblock prints in the late 1880s and spanned his entire lifetime. When he made his very first trip outside America, in 1905, it was not to Europe — that mecca of Western architecture — but to Japan. With his wife Catherine and another couple, the 37-year-old spent two months touring natural and historical landmarks from Nikko all the way down to Takamatsu. 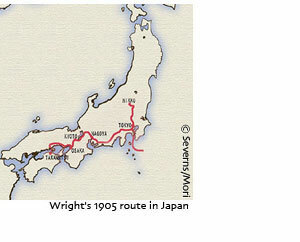 Wright was able to maintain his idealized image of Old Japan throughout the visit, calling the country "the most romantic, most beautiful" on earth, despite its creeping industrialization.